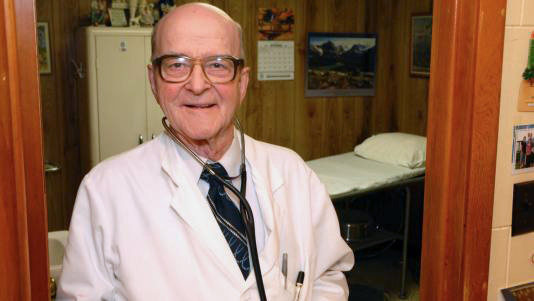 Arriving at his office just before 10 a.m. every morning — the beloved 87-year-old Dr. Russell Dohner begins to see his patients one-by-one as he has faithfully done for almost 60 years. These days Dr. Dohner charges patients $5 per visit — compared to the $2 fee charged when Dohner began practicing medicine in Rushville, Illinois back in 1955. The amazing thing is that Dr. Dohner, who sees his patients only on a first come, first-served basis — gets up before 7 a.m. each morning to make rounds at the local hospital before arriving at his office. He has no use for computers or fax machines either — in fact, Dr. Dohner keeps his medical records on hand-written index cards packed tightly inside a wall of filing cabinets. You should also know that the good doctor doesn’t accept medical insurance — convinced that it’s just not worth the bother. Dr. Dohner told The Associated Press that he intends to maintain his practice as long as he possibly can. “As long as I can make it up here, I’ll help if I can,” says Dohner, who has no plan to retire. He is a rarity for sure, serving several counties in small-town Illinois — working seven days a week without taking a vacation in 50 years. Read the entire story on Yahoo Finance.